It is a drama, and it does feel slow for someone like me who usually likes explosions and space ships and gunfights. But when it was over I said to myself: "Self, that was hands-down, no doubt about it, the best movie we've seen in a very long time." I loved it. True, this is a very sad and relentless movie so if you have little or no time for something sad then do not see this movie. For those that want a film that touches on complex and thoughtful themes (childhood, abandonment, death, anger, redemption) then this will interest you. But, when you add a fantasy element to it, then the film opens up to a whole other realm. Some children do live in other "worlds" when trying to cope with things that are beyond their comprehension and ability to process especially when they don't have anyone to hold them and protect them as much as possible. The acting my the young boy is devastatingly effective, and although I did feel Sigourney was miscast, she did a decent job with a rather unkind character until you start to see the pain that she is also experiencing. The score is exquisite but doesn't intrude in the film, and the photography and sets are incredible. And, the redoubtable Liam Neeson is superb in his characterization. Without him and his soothing yet ominous voice, this film would not have worked, no matter how well the other parts of it did. Worth watching but bring kleenex. I cried in this movie. My mom died of cancer almost 4 years ago and it's was hard to let her go. The morality and immorality of the society. Amazing after effects and very touching movie. 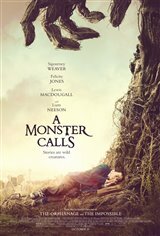 Amazing magnificent real heavy movie with fantasy monster but not what you think, in fact, a very moving and emotional film with great acting throughout all, so creative, heartbreaking, beautiful storytelling that you would be in tears from start to the end - wooow..Love it !! A good well spend 2 hours of entertainment. A lovely movie that quietly catches you up and sweeps you into Connor's world. Connor lives with his mother and goes to school but his mother is very ill and school has its own challenges. The movie is about life, and the power of stories; about find the truth and learning to face it. A wonderful coming of age story where magic and reality intertwine. The movie was interesting. But it could have been more entertaining. However, I do like the effects and graphics for the tree monster, that was well done. And I was surprised with what a small role Sigourney Weaver played, I wish she appeared more in the movie.